Until Griffith Jenkins Griffith bequeathed 3,000 acres of what is now the Hollywood Hills to the City of Los Angeles for use as a public park in 1896, the area had offered a trail of blood and bad luck to anyone who owned it. Soledad. When Feliz lay delirious with smallpox that year, Dona Petranilla was sent away so that she wouldn’t contract the fatal disease. Don Feliz was soon visited by a neighbor, Don Antonio Colonel, and his lawyer, Don Innocante. (No, they weren’t all named “Don;” it was a title people used when they wanted people to think they were important, or in rare cases, if they actually were.) Don Feliz was said to agree to the final draft, but another version of events had him nod in agreement because someone had fastened a stick to the back of his delirious or unconscious head. To no one’s surprise, Don Colonel got the ranch, Soledad made out with a few sticks of furniture, and Dona Petranilla got squat. The fact that she was also blind probably made her a trifle bitter. Don Coronel outlasted his family, watching while they died of disease or misfortune. His widow remarried, only to have her new husband try to divorce her and take it all. The litigation lawyers took almost all that was left. Don Innocante was killed in a bar fight. The next owner, Leon “Lucky” Baldwin, tried to run a dairy on the star-crossed land, but the business failed and he lost the lot to mortgage companies after a huge rainstorm, crop failures, and bovine diseases combined to run him off of the land and out of his wits. Not-so-Lucky Baldwin sold the land to Griffith J. Griffith in order to pay off the mortgage. Griffith was a Welshman who moved to California during the gold rush and made a killing in mine speculation. He donated the park to Los Angeles as an unconditional Christmas gift. A few years after this unexpected generosity, Griffith was convicted of trying to kill his wife, and spent a couple of years in San Quentin. 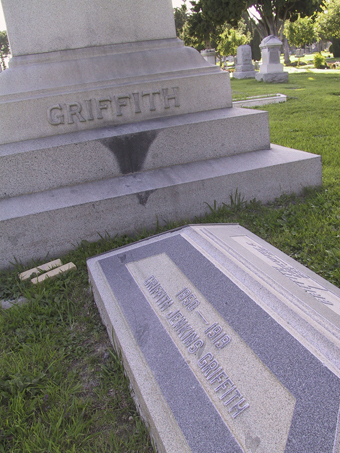 Griffith and most of his immediate family now lie six feet under a giant granite monument in the Hollywood Forever Cemetery, but the legend of the curse gave rise to ghost stories in the park which bears his name. Ranch hands working the property in the late 19th century said that they had seen Don Coronel, howling down the valley towards what is now the municipal golf course and the L.A. Zoo. The figure is reported to make appearances at Bee Rock, a granite monolith towering over the east side of the park. The curse seemed to abate once the City of Los Angeles took possession of the land, and perhaps the only dangers that remain for the weekend hiker are things like the bodies dumped off the fire roads, mountain lions, and six-foot rattlesnakes as big around as your bicep. The park is closed at night, so if the ghosts who stalk and ride the old trails of Griffith Park only put in appearances after sunset, they should be left in relative peace until the land inevitably changes hands again.